The Free Range Culinary Institute’s Founder and Master Game Chef - Denny Corriveau is a noted national authority on wild game preparation. He is the only game Chef to have created a national cooking school for wild game, and has worked with every major sporting organization in the country, as well as all major farm-raised game organizations; top culinary schools such as Johnson & Wales, national outdoor retailers such as Cabela’s, and major gun manufacturers. Chef Denny has been approached by many well-known companies such as Mossy Oak, to be a National Game Chef. He has also been featured in the Boston Globe, and countless sporting publications across the country, and has gained the attention of television networks like the Food Network, Discovery Channel, the Sportsman Channel and Outdoor Channel. 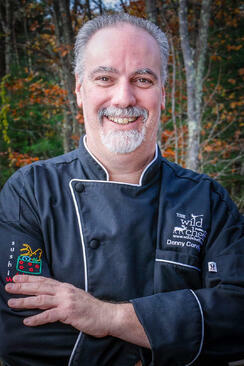 He is the featured game chef for the weekly New England outdoor television show Wild Side, and featured as the Celebrity Game Chef for a weekly national radio show called “The Sporting Life Radio Show” which airs on iHeart Radio. He has also had television featured segments dedicated to him and his work with wild game. Chef Denny is highly sought after for his wild game teaching expertise, and is additionally called on by various high-end hunting lodges and private ranches. Celebrities also have the WildCheff on speed-dial to cook his very unique specialized wild game food offerings for special events and private venues across the country. A few notable celebrities that he has been asked to cook for include Quarterback - Tom Brady, the New England Patriots, NFL Executives, Ted Nugent, and Duck Dynasty stars. Chef Denny is also the featured game chef for Matt Light’s Annual Celebrity Shoot-Out, where he serves up a wild game tasting and free-range lunch for over 500 people. As a trendsetter and wild game culinary evangelist, he is often referred to as the “Emeril Lagasse of Wild Game”. He has helped thousands of game enthusiasts to embrace his “best practice” approach for cooking game that he has taught for over 25 years. Chef Denny is also known for his wild game work with Wounded Warriors and Disabled Veterans, as well as charitable organizations such as Salvation Army.